A very early and well-known automobile, the Waverley Electric was produced from 1896 to 1914 and was called "by far the best Electric on the market". Owned by such celebrities as Diamond Jim Brady, Willa Cather, Madam C.J. Walker (African-American hair care entrepreneur), General Lew Wallace, Thomas Edison, and William Horlick (creator of malted milk), the Waverley traces its name to the earlier Waverley bicycle produced by the Indiana Bicycle Company from 1893-1899. The first Waverley Electric built in 1898 was a two-person Stanhope based on C.E. Woods' American Electric and utilizing Elmer Sperry's patented battery that kept its charge much longer than other batteries. The Stanhope, priced at about $1500, was a buggy with high seat and closed back, especially favored by physicians. The Waverley Stanhope had tiller steering, an upholstered leather seat, 36-inch, ball bearing wooden wheels with pneumatic tires, and a headlight centered on the buckboard frame. Its radius was 40 miles and its top speed 14 mph. Said to be the first woman driver in the U.S., Genevra Delphine Mudge drove a Waverley Electric on New York City streets in 1898. In 1900, the Indianapolis company joined the American Bicycle Co. trust headed by Albert Augustus Pope, father of the American bicycle and manufacturer of the Columbia electric car—and Pope became involved with Waverley manufacturing. An interesting characteristic of one 1900 Waverley was a front seat that faced the rear. The driver sat in the back seat operating the center steering lever—in position to converse with his passengers. The physician's model offered side curtains and a storm apron to keep the vehicle as dry and comfortable as a closed carriage. Its battery was guaranteed for two years and it was said to be "safe, speedy, noiseless, odorless, and economical". The dos-a-dos had two seats back-to-back so front-seat passengers sat with their backs to rearward-facing back-seat passengers—and Waverley, removing any doubt as to battery efficiency, threw in a contract for battery maintenance for five years. 1901 Waverley Electric first run in 80 years. Three different-sized motors powered the 1901 Waverley electric. 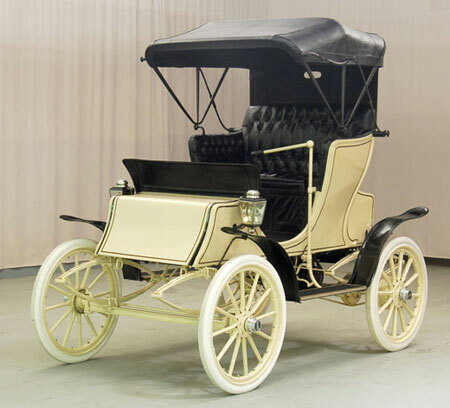 The runabout (a 2-passenger model with an emergency seat for another two) had a 1.5 HP engine, the Phaeton and Stanhope were powered by a 2.5 HP motor, and the Brougham (equipped with an electric heater) and heavier delivery wagon ran on a 3.5 HP motor. The heavier motor was powered by 44 battery cells, each cell weighing 9 pounds or more. It was also in 1901 that Edison tried out his new storage battery using cadmium and copper instead of the more-standard lead. In a Waverley electric that weighed 1800 pounds, his batteries weighed 653 pounds, bringing battery weight down to 33% of total weight when other battery weights were closer to 45%—and the batteries powered the vehicle over 94 miles. While this battery and the battery Edison developed by 1903 utilizing potassium hydroxide with iron and nickel electrodes did have some advantages, they also cost a good bit more than standard batteries. A 1902 ad for Waverley vehicles now manufactured by the International Motor Car Co. featured a young man clad in double breasted coat and cap—looking a lot like the Whitman candy delivery boy—steering the vehicle through a stone gate opening. The claim was that you could drive 40 miles on a single charge in a car that was "stronger, better & more substantial in every part than any other electric automobile on the market." That year's Model 21, so the claim went, had a 60 mile radius and was priced at $850. The following year International showed the car at the New York Automobile Show as the most up-to-date and practical electric vehicle made. 1903 was also the year in which Pope bought International, lending his name to the Pope-Waverley. Advertisements in that year touted electric vehicles with appeal to anyone with an interest in an "absolutely noiseless, odorless, clean and stylish rig that is always ready and that, mile for mile, can be operated at less cost than any other type of motor car." Both the driver and the passenger were smiling women. Even though women represented a very small proportion of car drivers, the electric was easy for them to start, easy to drive, usually came with an enclosed coach body, and could be maintained by professionals rather than a driver and his ever-present toolkit. As another '03 ad had it, "No complications. Turn on power and steer." In 1904 Pope sent Herbert H. Rice, his employee since 1892, to manage Pope-Waverley in Indianapolis. Expectations were that he would need 800 workers to produce the cars in numbers that would keep up with customer demand. The 1904 line-up came with shiny brass trimmings and included the 2-person, 3-hp Chelsea for $1,100, the 3-hp Road Wagon with a rear, open cargo box for $850, the Edison Battery Wagon equipped with 48-cell Edison batteries at the rear of the car for $2,250, and the Tonneau that seated five, had twin rear motors, and an armored wood frame for $1800. 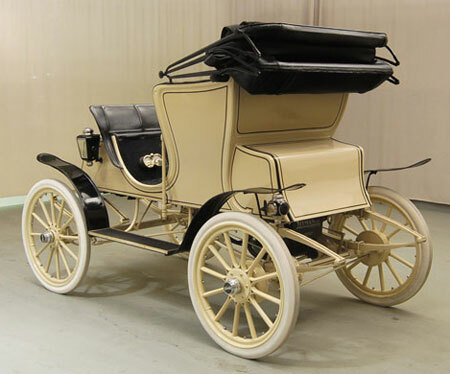 The Model 69 Runabout with top which sold for $1,325 featured a noiseless herring-bone gear as one feature that "made it the most popular carriage in the electric field, and the envy of manufacturers of all other electric cars." A Model 30 Station Wagon, also available at $2,000, was advertised as a "stylish, superbly finished and appointed carriage". The ad also showed a gentleman in top hat helping a stylishly cloaked lady, her way lit by a side carriage lamp, to step down from her enclosed carriage while her chauffeur sat at the ready ahead of the enclosure. For other sectors of the market, Pope-Waverley offered a very basic delivery wagon. Interested customers who wrote in with the character of their business, the number of horse-drawn vehicles they used, and the approximate weight they carried, could get from Waverley illustrations, specifications, and costs for the electric delivery van(s) needed. Some fire departments selected a Pope-Waverley electric fire engine, as well. The Hopedale, Massachusetts fire department used one to respond to calls and found that the engine could be on the road less than 10 seconds after the alarm was sounded — and could go up hills and over poor quality roads at the breakneck speed of more than 10 mph. Electric cars were increasingly popular in 1905, continuing to outsell vehicles powered by steam or gasoline. Waverley produced a range of "always ready" vehicles listing from $850 to $2,250 and including runabouts, surreys, coupes, Chelseas, and others. Production doubled that year and advertising copy claimed the all-important batteries were "not materially affected by heat, cold, rain or snow." Another claim was that "in the gasoline field there is some latitude for investigation and comparison — in the electric field your choice is narrowed down to the Pope-Waverley." Waverley manager Rice wrote in an article for The Horseless Carriage that the electric car could be cared for by its owner "in his stable, whether by himself or his man, much easier and cheaper, not to say with more safety than a gasoline car." He added, as well, that central lighting stations were becoming open to the notion of charging electric vehicles and that new mercury arc rectifiers were available for home use. Rectifiers kept vehicles charged by turning residential alternating current into the direct current needed for the car. Rice didn't mention, though, that the rectifier would take up an entire wall in the garage, was loud, and emitted an unearthly, flickering, bluish-green light — small price to pay, he might have thought, for added convenience. 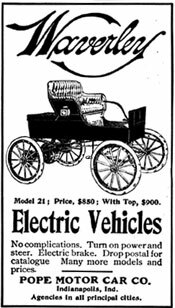 It seems there was also a used car market in 1905; Fisher Auto Co. in Indianapolis offered a pre-owned Waverley electric with new batteries, a good top, in A1 condition for $350. In an ad for the 1906 Pope-Waverley captioned "Her Fondest Wish" there was an inverted wish bone towering over a Waverley. At the bottom right of the ad a woman with an upswept hairdo and high-necked, period dress clasped her hands together on her chest and wished determinedly. The ad copy read, "If you deliberately set about it to figure how you could bring the most happiness into your home could you possibly hit upon a better medium than a Pope-Waverley Electric? These swift, silent, ever-ready electric carriages have become not only a luxury for which every woman longs; but an actual essential in the daily round of social engagements, shopping tours, trips with the children, and the hundred-and-one uses for which they are available." The ad was clearly aimed at the early version of a very busy soccer mom. The Christmas version of the same ad noted this was just the time to buy since the Waverley worked perfectly on the coldest and stormiest days. There was no water to freeze, no oil that wouldn't feed. With unchecked enthusiasm, the ad's creative writer penned these words: "Its readiness, its ease of control, the gentle speed with which it lures you out to where the air is pure, and the way in which it adds to the sheer joy of living, will breed an affection for your Pope-Waverley that has never been lavished before on an inanimate object". For '06 models the standard was black paint with Brewster green panels and upholstery was dark green broadcloth or buffed leather. Buyers could choose Goodyear or Goodrich tires. Speeds generally ranged from 5-18 mph. and a 3-ton truck was sold which had an overall length of 16 feet, 5 inches and a width of 7 feet, 6 inches. The operating manual showed a truck with the logo "Pillsbury's Best". Another ad — for the '06 Station Wagon — featured a nattily-dressed couple safe inside the carriage while their driver sat outside in the weather. The text read, "No automobile stable is complete without this luxuriously appointed carriage. . . [that] embodies every requirement of comfort, convenience, style, safety, and dispatch." Despite all the advantages the Waverley offered and their admonition to be sure the name Pope was on your automobile, there still was competition. This was the year Henry Ford first marketed his Model N, a 4-cylinder runabout priced at $600, less than electric cars were costing. And the gasoline-powered cars offered some other advantages, too. If your gasoline-powered car stopped, for instance, you could walk to a nearby store and purchase some gas whereas if your electric car stopped, you had to push it instead or go in search of a horse. Tires, front: 30 x 2 1/2 in. Tires, rear: 30 x 3 in. At this time the Waverley was also showing at the New York and Chicago National Automobile Shows to favorable popular and press reception. A financial crisis that hit the country in 1907 took the Pope empire with it. When the New York Stock Exchange fell almost 50% from the previous year, there was a loss of confidence leading to runs on banks that caused many local businesses to go bankrupt. In Pope's case he couldn't pay a Toledo firm a little more than $4,000 he owed them. As soon as others became aware of that default, a flood of claims followed — forcing sale of Pope assets. In-house manager Rice and a group of management investors purchased the Waverley factory. In 1908 the new team was advertising Waverley as the best electric to buy — and the easiest to sell. The Automobile magazine of October 28, 1909, announced the take-over by conservative businessmen "not disposed to spend money foolishly". The pressures of gas-powered vehicles and especially the introduction of Ford's Model T were clear, however. Rice acknowledged the limitations of electric vehicles, advising motorists to give up on the hope for a battery that would go a hundred miles on a single charge. The new owners of the firm also introduced a front end on the Waverley that more closely resembled the gasoline-powered cars of the day. 1909 Waverley Electric Front View. In 1909 Waverley boasted that its automotive output was the largest in the world and that its cars were "as swift as the speed laws of the average city will permit". "Dignified, distinguished, and fashionable", the Waverley Electric was said to have eliminated the bearing trouble other electric cars faced and to be "more of a social factor than even the finest gas car made". Whereas the Coupe came with a detachable top so drivers could enjoy the nicer weather, the 1909 Electric Runabout had a fold-down, lined black leather top. The upholstery, dashboard, and over-wheel mud guards were also black leather. Steering was by means of a left-hand tiller. The car featured brass side lamps as well as a tail light and white tires with wooden wheel spokes the same color as the body. It had a patented controller, as well, for driver safety; the car would only start if it was in a stationary position. 1909 Waverley Electric Rear View. The following year the Waverley, advertised as the clean, noiseless, and safe, had an enlarged wheelbase, increased wheel size, full elliptical springs which added comfort and durability, and a claim that it could run 80-90 miles on a single charge. That year's Coupe was a luxury car for four and came with a variety of choices. Besides the normal paint and upholstery choices, you could choose solid or pneumatic tires and an Exide, Waverley, National, Ironclad, or Edison battery. (Rice, now Vice President as well as Manager, suggested to customers that they could economize by selecting a standard battery.) Selling for $2,250, the Coupe had a lightweight aluminum body, side windows for more visibility, and dropped sills providing easier entry. Dust-proof casings protected working parts. The manufacturers finished their cars with 16 coats of paint and varnish, upholstered them with expensive grades of broadcloth and leather, and insisted upon multiple inspections. Good looks and a smooth ride kept customers coming back. An ad for the 1910 Limousine-Five pictured five imaginatively-hatted ladies out for a drive and told their story, that of "A City Journey Luxurious for Five": "The drive from the Sheridan Rhodes' home to the theatre and back, was a pleasure equal to the play and the supper. Within the long broad Silent Waverley Electric Limousine there was ample room for the Misses Rhodes and their three guests. There was no anxiety as to the crushing of delicate gowns, for each had ample room on the deeply upholstered seats. Miss Evelyn Rhodes drove the car both ways. The full view ahead through the large front window, and the instant response of the car to the pearl handles of the controller and steering lever completed a charm which she insisted was the 20th century improvement over the magic carpet. The car sped along silently. Beneath, a powerful motor obeyed the mystic current — steel and bronze were busy — long full elliptic springs took up every shock — and the machinery gave forth no sound. So perfect is modern electric carriage building." Imagine — a dainty member of the female persuasion driving an electric magic carpet both ways. The 1911 models featured a high-efficiency, enclosed shaft drive, one that could not be clogged with mud and dirt the way exposed chain drives could be; large French plate windows; and a promise that its drivers would not face the "terrors of excessive tire expense". Even though they cost less than a cent a mile to run and required no chauffeur, they were still luxurious; the Model 81 Brougham's interior, for instance, being finished in broadcloth, broad lace and "Goat Morocco." Its standard furnishings included a flower vase, two vanity cases with watch and salt bottles, pockets for small items, a match safe and cigar holder, and a convenient umbrella holder. (Pass the Grey Poupon, anyone?) Even a blizzard, its manufacturers claimed, would not delay the electric carriage that was dependable on the worst winter days. The decidedly up-market feel continued in the 1912 ads that spoke to the Waverley's ample room with four separate seats, operation so easy "your little girl can run it", and fabric found in European markets. Other full-color ads showed a scene at Abbotsford, home of Sir Walter Scott who wrote the novel Waverley in 1814. Abbotsford looked every bit a castle and Waverley even designed its own coat of arms. There was certainly no question that the Waverley Limousine, now offered as a front-drive electric with high efficiency shift drive and advertised as having the luxurious comfort of a spacious parlor car — looked like a fancy living room on wheels. One ad for that year is a little puzzling in that it shows a dapper gentleman in top hat carrying a cane and a woman in a long dress with frilly jabot (ruffle cascade) and wearing a hat with a deep, fold-back brim and long feathers down her back — but no driver. The couple, man seated at the far right and woman in the further-recessed center seat, may just have been waiting for the driver to take his overstuffed seat at the rear left of the car — with a single front seat at the right of the vehicle facing all of them. There was plenty of space, too — enough "for golf clubs, parcels, bags, etc., out of the way behind the two side chairs". And for any of you wondering, there were fresh red flowers in the bud vase, too. 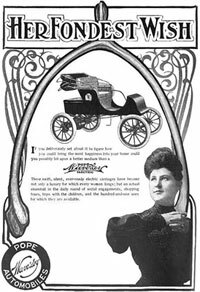 If somehow a prospective customer had missed the point that this was one elegant car, the ad also depicted two ladies in brightly-colored medieval garb, holding intricately knotted ribbons, another touch of the regal — from the Camelot era. And still other ads mentioned that the Limousine body design was a "refinement upon the famous town chariot of France, used in the period of the first empire". Other models offered their own advantages, as well. The "smart, sturdy, speedy" roadster came with horizontally folding windshields and side windows that lifted off and made claim to cutting upkeep costs in half. It had a folding landau top and was built on the lines of the latest gasoline roadsters. The four-passenger brougham, at $2,800, was advertised as having no tire trouble and never freezing up — running at "not half the expense of most gas cars". It was nine inches longer than the '11 models with more ample interior space. The Surrey was intended as a family car — for drives to the park, on country roads, or to the country club. It had both front and rear doors, metal fenders, and could get up to 20 mph. For 1913, when sales of electric cars peaked in the U.S., popular Waverley models were the Chelsea and the drop-sill Victoria. That year's Limousine-Four, at a cost of $2,900, featured a "low hung body (a full six inches lower than any other high grade electric), low set chairs, [and] amazing easy riding". The driver had a "full view ahead from the old time, sociable left-hand rear seat". Interestingly, the tide has turned towards favoring American over European design: upholstery was of the best American manufacture and the lamps and flower vase were of a Colonial pattern. Luxury touches continued in the 1914-15 brougham at a cost of $3,150, which featured rounded corners on the body, utilized lightweight aluminum in the room and panels, and had covered battery boxes front and rear. Other elements included a trussed hardwood beam frame, 5 quarter-elliptic springs front and rear, and a double set of expanding brakes. Its standard color was black with blue panels but colors could be customized — and its range was 75 miles. Buyers had a choice of front drive, rear drive, or front and rear drive. A brochure for the car encouraged wish fulfillment: "Make a mental picture of all the desirable features in an electric brougham and compare it with the new car point by point. You will find them all embraced in the car before you." The 1914 Coupe had a 104-inch wheelbase, a long hood — and a false radiator. In 1915, following the retirement of William B. Cooley, Rice — who certainly knew the business — became President of Waverley. That year, however, the Model T was selling for a mere $490. When customers also found that the Model T could go 200 miles on a tank of gas, they were convinced. While the Waverley for many years was synonymous with luxury, its slow speed began to annoy its drivers. In the long run, it simply could not compete with gas-powered, low cost cars. In 1916 the Waverley Company closed its doors.